Thanks to a research grant I got on stereo vision topics in 2010, I produced an application exploiting both depth images and visible spectrum images (i.e. regular images), aimed to detection of obstacles and their classification (i.e. understanding if they are pedestrians, vehicles, debris, etc.). I eventually produced an application aimed to the safety in tractors, for the business in precision agriculture. 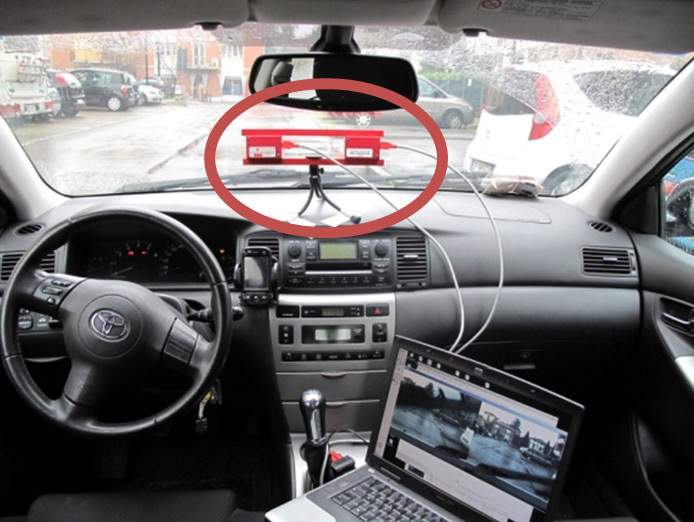 Let me show here a test installation on a car and a demo video; the speed of the car and of the events happening, much higher than a tractor, make the detection definitively more challenging. on the right the superimposition of the two: here you can also see a white rectangle, that is the focus of attention of detection, which is automatically positioned based on the ground level estimation. obstacle that are too close are highlighted in red (the threshold between green and red is just a parameter). pedestrians are boxed in yellow. A few more demo videos: the last one is taken under heavy rain.